I love my garden and this year my garden took a big hit … lightning had its way and took down an extremely large maple tree and left me with, well let’s just say a garden that needs some work. The Goal: Oh, just the perfect English garden–one with just the right amount of order and disorder; just the right amount of free flow and symmetry and one that has a bounty of problem-free flowers and birds and bees and butterflies. Even during my “tree grief,” it didn’t take me long to realize that less tree = more sunshine and that means more roses. And, while I’m dreaming, the roses will be the garden-catalog variety, no aphids, no black spot, no powdery mildew and absolutely no Japanese Beetles. Think I have a chance? Well, NO … but we are now “in the bleak mid-winter” and this is the perfect time for dreamin’! Hopeful Completion Date: May 15 // The historical roses start blooming the end of May and I don’t want to be in an ugly stage while they are showing off. So here’s hoping we have an early and somewhat dry spring! Back to reading, sketching, planning, plotting and dreamin’! 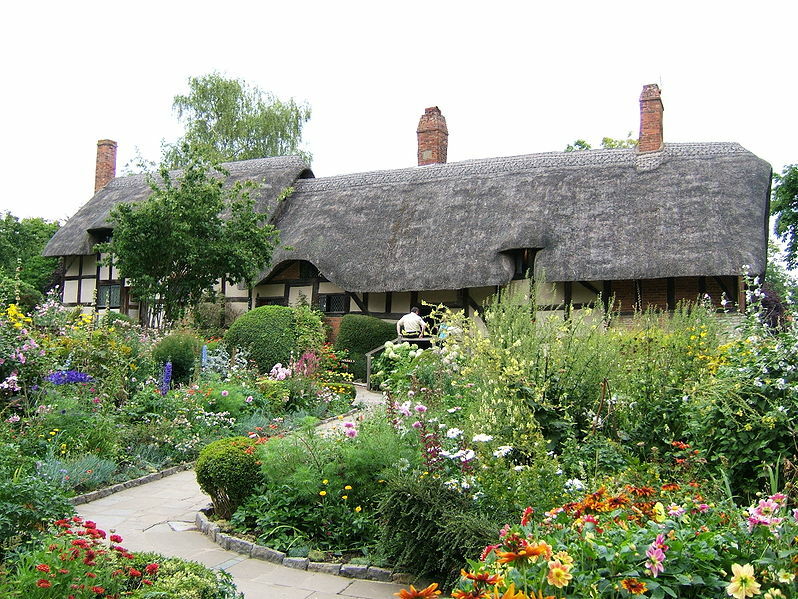 Anne Hathaway's Cottage (wife of Shakespeare) // I could be happy with a garden like this!